Royal Brunei Airlines has welcomed the delivery of the first of its Airbus A320neo aircraft during a delivery ceremony in Toulouse, France. 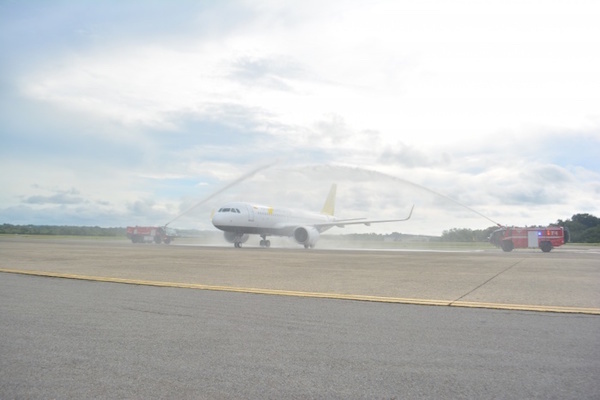 The aircraft is the first of seven firm aircraft and three option aircraft ordered by the national airline of Brunei Darussalam as part of its fleet renewal program announced in 2014. Karam Chand, chief executive of Royal Brunei Airlines, said: “Airbus A320neo aircraft come equipped with Leap-1A26 CFM engines featuring some of the best fuel, noise, emission and operating efficiency in its class and will allow Royal Brunei Airlines to achieve significant cost savings and reduce its emissions footprint. “We are based in Brunei on the island of Borneo which has one of the most pristine environments on earth and we are pleased to be playing a part in preserving this. “Royal Brunei’s Airbus A320neo is also the world’s first narrow body aircraft fitted with Thales Avant (Gen5) in-flight entertainment system which will provide our guests a significantly enhanced experience on board and match those generally available on long-haul aircraft. “They will also have business, economy plus and economy seats with leather covering, USB power outlets and audio/video on demand at every seat. Royal Brunei’s first A320neo aircraft will be in revenue service from this week with Singapore selected as the first destination from Brunei. Their current fleet consists of ten aircraft; four Boeing 787-8 Dreamliners and six A320ceo. Eight new aircraft will join its fleet by December – a fifth Boeing 787 and seven A320neo). Royal Brunei will have one of the youngest fleets in the world with an average age of two years by the end of 2018. The national carrier of Brunei Darussalam today operates out of its hub airport – Bandar Seri Begawan to 18 destinations across the world.